This weekend, the San Antonio Better Block team set to work preparing the area for the Better Block project. Several groups took part in cleaning up the buildings on the 1100 Broadway block by emptying out the spaces, painting, and removing graffiti. Larry Clark began work converting a trash and weed-filled parkway into a rain garden that will clean water that comes off the street while providing irrigation to native plants that will be brought into the space. Andrew Howard began chalking off the area showing where pedestrian bulb-outs can be created to slow traffic to a safer speed while allowing better sight-lines for residents walking in the area. 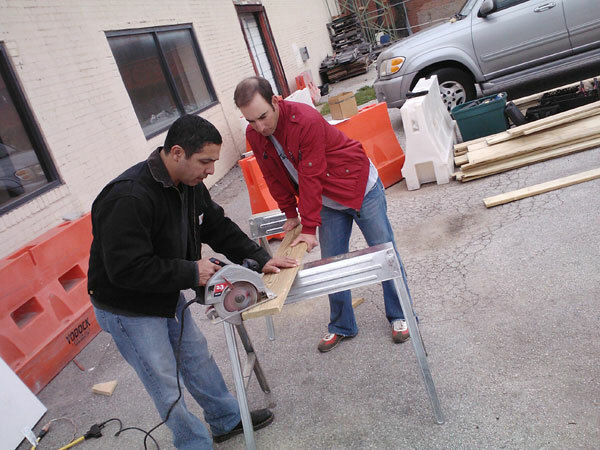 TBG Architects set to work building benches and planters that will be used to create a more active street front along Jones Boulevard. So far, we have 5 pop-up businesses that will be installed in the Better Block area including art galleries, a cafe, flower shop, and kids art space. It should be an amazing event…hope to see you all out! The outcome looked great, thanks for all your hard work and time! The best information I have ever noticed. I really enjoyed while reading the Article.